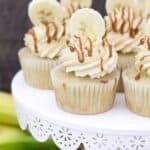 These Banana Pudding Cupcakes are made from scratch and are filled with a banana pudding and vanilla mousse and topped with dulce de leche. If you’ve been reading my blog for a while, you know that Lindsay from Life, Love and Sugar is by blogging bestie. Today is a SUPER special day because we’re celebrating that she is about to have her first baby BABIES! Lindsay and her husband are being blessed with unexpected twins. Lindsay has shared her journey through infertility, and after finally going through IVF last spring, they were thrilled find out they were pregnant with a baby boy. Then after one of her early ultrasounds, she texted me, “we’re having twins”. I immediately called her back and I think I dropped an f-bomb or two along with more than one “are you serious”? It’s really just starting to set in with me. I couldn’t be happier for her because I know how much these babies mean to them and I can’t wait to meet them!!! I have always wished we lived closer to each other because we have become such close friends and since I couldn’t be there for her baby shower, it only made sense to ask some of our blogging friends to help me celebrate with a virtual baby shower. I know, it’s like a weird blogger thing, but we all live so far apart! 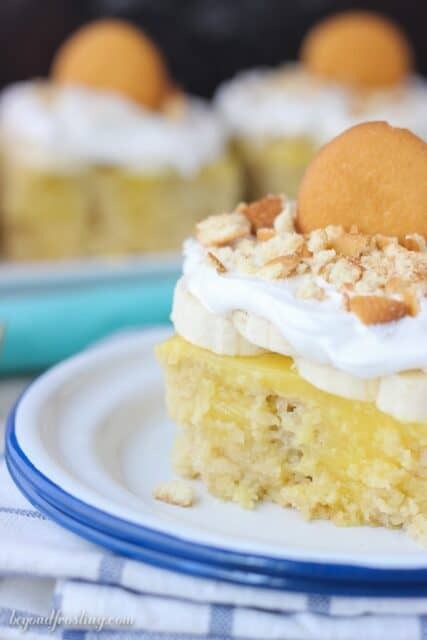 It was SO hard for me to pick a dessert to share for the party, because even though I am a party of one over here, I really wanted to make some of Lindsay’s favorites. She loves banana pudding, anything with caramel and dulce de leche and anything Bailey’s-flavored. I’m convinced she is responsible for my banana pudding addiction as well. 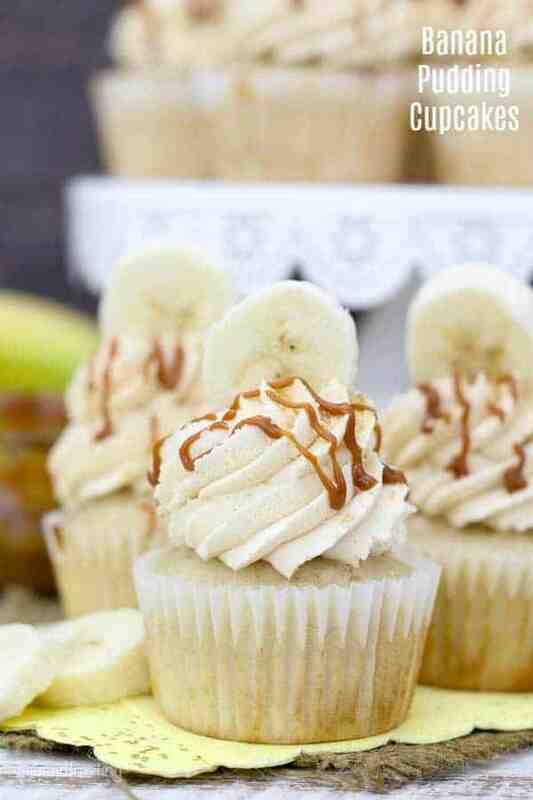 Finally, I decided on Banana Pudding Cupcake from scratch, with a banana pudding filling and a vanilla mousse on top. 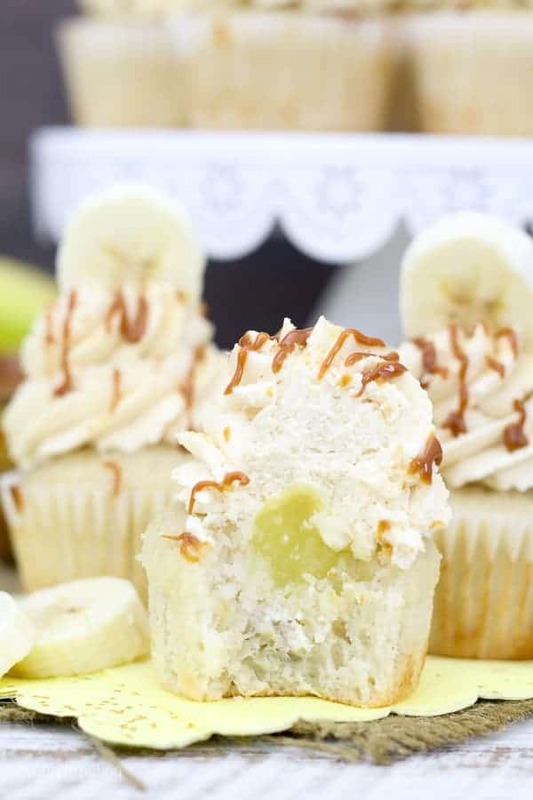 The homemade banana pudding cupcake is a variation of my moist vanilla cake. I scaled the recipe to make 12 cupcakes, but it could easily be doubled. 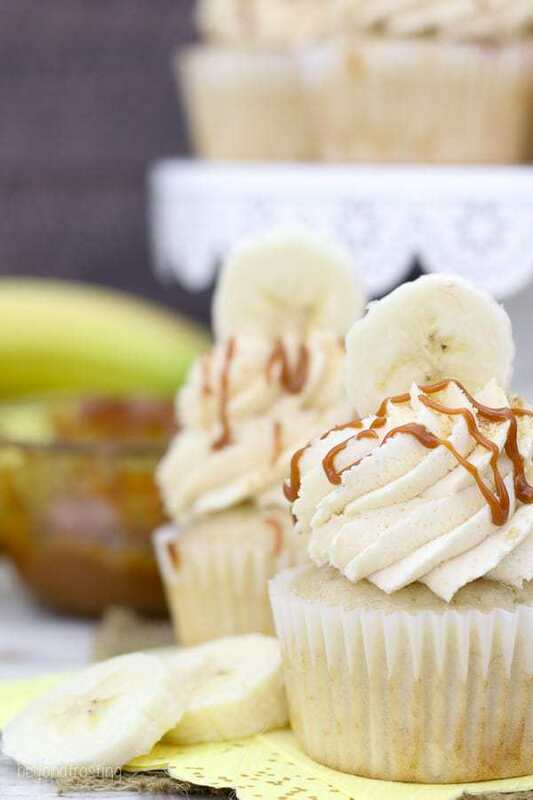 This cupcake has a denser crumb with a rich banana flavor. 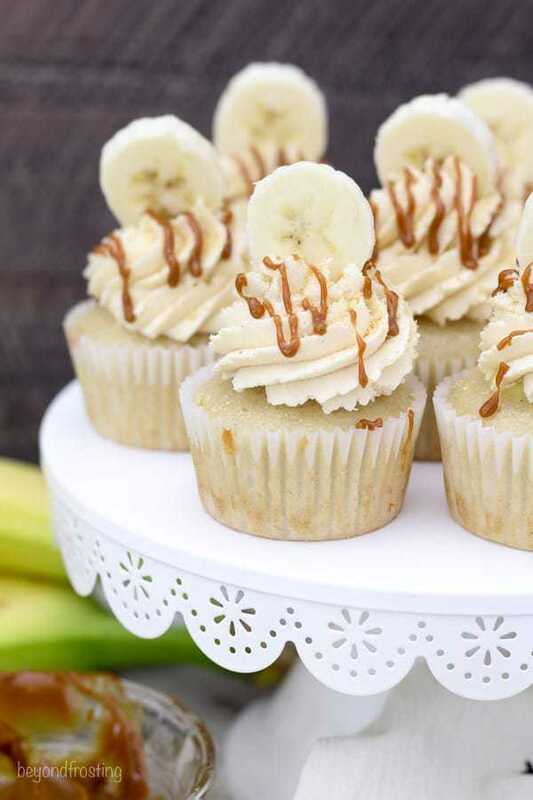 The riper your bananas, the better these will be. I wanted to add a filling to these because I just love a little surprise inside a cupcake. I opted for an instant banana pudding, but I only made a half batch since there’s only 12 cupcakes. 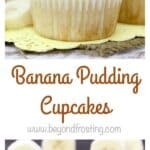 You could certainly use a vanilla pudding too, but I just love the added banana flavor. I used a knife to cut out the centers of each cupcake, but you can also use my favorite tool, the cupcake corer. Once the pudding has set, just use a small Ziploc bag to fill each cupcake. For the topping, I made a vanilla mousse with a touch of dulce de leche. It’s made with heavy whipping cream, instant vanilla pudding and dulce de leche. First, you need to whip the heavy cream until soft peaks form, and then add the dulce de leche. Once it’s been blended, add the instant vanilla pudding. This turns the whipped cream into a thick and stabled mousse. It’s much denser than a whipped cream, but lighter in texture than a frosting. For the garnish, I pipped more dulce de leche and also sprinkled on some Nilla Wafer crumbs (graham crackers work fine too!). 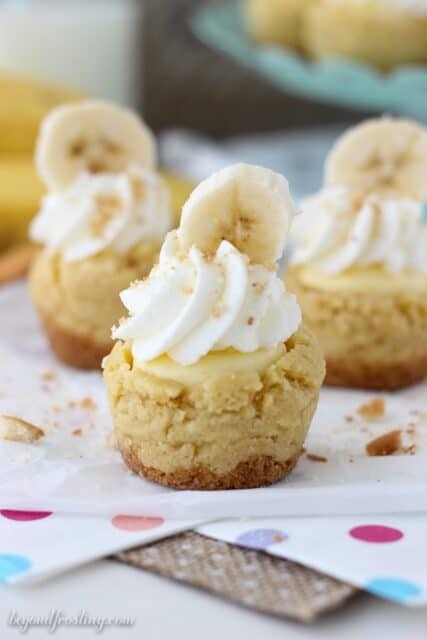 You can also add a slice of fresh banana if you’re serving these right away, or even banana chips. The garnish is totally optional. These cupcakes need to be refrigerated, but they can be made the night before serving and stored in an airtight container. Dear Lindsay, as you are about to embark on this new journey of your life, everything is about to change. You have nothing but love to give these boys and I can’t wait to see you as a mom. You and Ian have been through so much to get to where you are today and God has answered your prayers, twice! Just remember I am only a phone call away and one day, I’ll show up with a much needed bottle of wine (well prosecco, duh). For the cake: Preheat the oven to 350°F and line a cupcake pan with liners. Next mix in the smashed and beat until well combined. Use a spatula to scrape down the sides of the bowl and stir the batter from the bottom to the top to ensure it’s well mixed. Use a large cookie scoop to divide the batter evenly between the cupcakes liners, filling about 2/3 full. Bake at 350°F for 14-16 minutes, remove from the oven and allow to cool completely. Test the cake for doneness by inserting a toothpick into the center of the cake. If the toothpick comes out clean, you cake is done. Allow the cake to cool completely. For the filling: In a bowl, combine the instant pudding and the milk and stir until the powder dissolves. Refrigerate until the pudding is firm. Once firm, pour the pudding into a Ziploc (or piping) bag. Cut out the center of the cupcake using a knife or a cupcake corer. Fill the center of the cupcake with pudding. For the topping: Prepare your mixing bowl by placing in the freezer for 5-10 minutes to chill. Pour the heavy whipping cream into the chilled bowl and beat until soft peaks form. Add the dulce de leche and beat until combined. Finally add the instant pudding mix and continue beating. The whipped cream with thicken quickly, beat it just until you feel the powder is combined. Use a large open star tip to pipe the mousse on to the cupcake. Garnish with dulce de leche. Keep refrigerated in an airtight container. Hi Criscencia, 14-16 minutes if correct for cupcakes. If you are baking a cake, it might be more in the 25 minutes range.